They are Australia's smallest parrot: are green, have a short tail, are about the size of a leaf, look like a leaf, and unless you see them land, are extremely difficult to see well. Most times it is 'chit, chit, chit' as a stubby, green flash flies overhead. A 'flying green potato' is a good description. 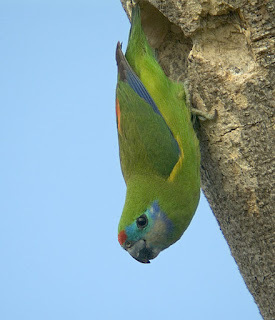 The Double-eyed Fig-Parrot usually excavates it's own nest in the dead extremities of trees, and as the top breaks off, it will move it's way further down the tree until the usefulness of the tree is finished. Often a tree will be used for several years. You can see some shallow excavations in this photo of the male. One such tree along Stewart Creek Rd came down in a storm last week and it was fascinating to see what a large cavity it creates for it's nest. The bird is only 13 cm in length, and the entrance is tiny, but the cavity is much bigger and beautifully formed. This year seems to have been a particularly good breeding season for these birds.